Made by Swags for Homeless in Australia, Oceania, 2011. Backpack Bed by Swags for Homeless are an innovative design solution to the problem of temporary housing for homeless people. These swag beds provide safe, warm shelter. They are made of a new material, Litetrex, that is durable, fire-retardent, lightweight, and easy to set up. Where the design focus for these beds is largely on aiding the homeless, they have also proven useful in disaster situations for displaced persons. 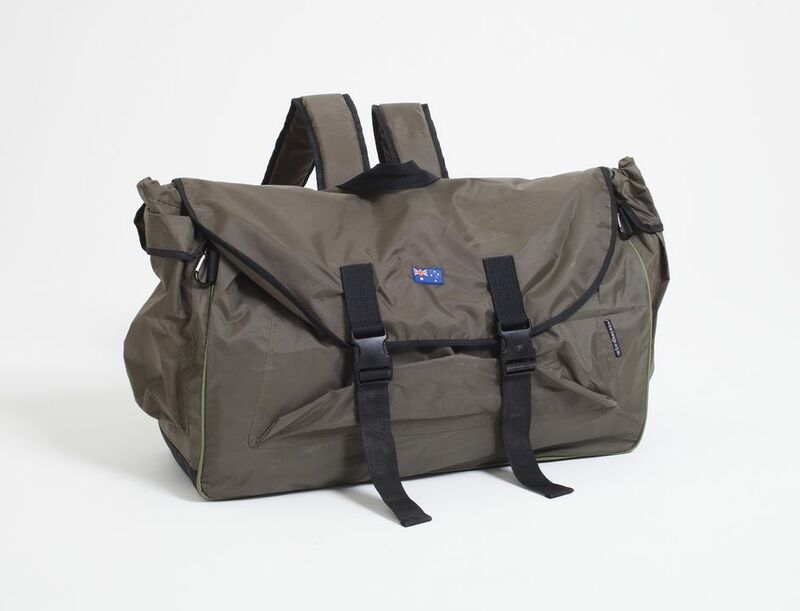 Khaki green nylon backpack which unzips and unbuckles to form a swag bed. The shelter is wedge shaped when opened up with a wide opening and narrower foot area. There are mosquito netting windows, three guy ropes and tent peg loops on the base. Inside the backpack part is a zippered pocket. In the zippered pocket is a brass padlock with keys which is held in original cardboard box. A small Australian flag has been sewn on the outside of the top flap. Inside the backpack is a printed label with the organisation name, a blank space for the owners name and information about what the organisation does and how to purchase the swags. Sewn to the inside of the bag is a label with material and care instructions. This object came to the museum via the Australian International Design Awards 2011. It is made of Litetrex, an Australian design material that is highly waterproof function fabric similar to Goretex and Thinsulate. Backpack beds are manufactured in China, and distributed throughout Australia, New Zealand, Germany and the UK. Where swag beds hold a somewhat romanticised place in Australian history (largely due to the informal national anthem, Waltzing Matilda's verse, "once a jolly swagman, camped by a billabong? "); the reality is that homeless people who sleep rough face violence and theft, as well as serious health risks and negative police interference during much needed respite. First exhibited at the Powerhouse Museum in 2011 as part of the Australian International Design Awards, the Backpack Bed by Swags for Homeless revolutionised canvas bedding with their new Litetrex material. It makes the pack lightweight, contemporary, and convenient. Living with dignity is one of the first sociological steps towards more permanent accommodation for homeless people, as does having lockable spaces for valuables, and breathable, waterproof materials providing them with the privacy, safety and shelter every person deserves no matter what their station.